My main motivation for this really does come down to the incoming of winter squash and I am happy to share that the time has come. Acorn, butternut, spaghetti—these are what I have been waiting for. The varying colors, shapes and sizes epitomize fall for me, echoing the changing colors and forms of nature. The advent of pumpkin patches and haystacks remind me that a cozy blanket and some hearty soup are not too far away. 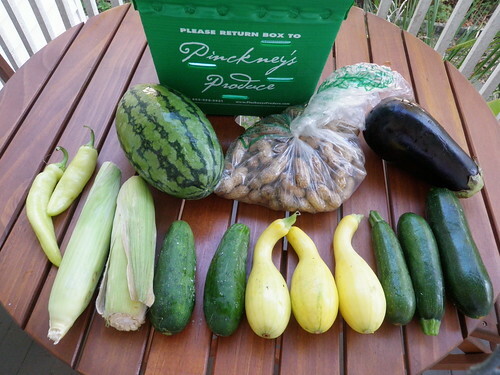 Week 1 Produce: 3 zucchini, 3 yellow squash, 2 banana peppers, bag of green peanuts, 1 small watermelon, 1 eggplant, 2 ears of corn, 2 pickling cucumbers. 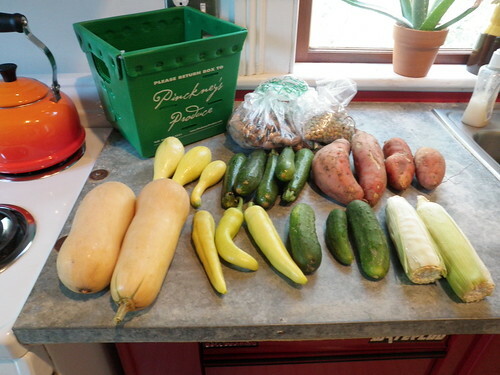 Week 2 Produce: 2 butternut squash, 3 banana peppers, 3 pickling cucumbers, 5 zucchini, 3 yellow squash, 4 sweet potatoes, 2 ears of corn, bag of green peanuts, bag of peas. As you can tell, there is no shortage of produce even for an individual share size. Executing the completion of my CSA box before the next arrives proves to be both daunting and comforting at the same time. It takes planning and discipline. With a “No veggie left behind” outlook, I am determined to get my money’s worth and not be wasteful, yet still take the time to enjoy my food. I would rather not spend all of my Sunday scarfing what’s left. On the flip side, I also take comfort in a few things: every Tuesday I can expect the delivery, my menu for the week is already half-planned, and that veggies are waiting in my fridge for me to reap their nutritional benefits. If you think this challenge sounds like more of a nightmare I would not disregard the farm veggies all together, there are many options. Charleston has many great venues for getting local produce any day of the week, and that is really what this is all about. Check our previous coverage on local farmer’s markets here. Another perk to CSA-ing that I have taken advantage of is the trade box. (Some farms allow you to visit the farm and compile your own box). Whether you are allergic, dislike, or in my case, have had an overload of a veggie (I’ll admit, it’s possible), you can trade it out. I did feel a moment of guilt trading out my eggplant for another butternut squash, but I had to. I probably would have traded out everything I got for more of it. Butternut squash soup, zucchini bread, and learning to pickle cucumbers are all on the docket for this week. Share what you're up to in the kitchen below in our comments section. Or, if you'd like to check in on what's been cooked up with our CSA veggies in the previous week, here's a link to the CSA Week 1 Forum.